Car sales boost in August | What Car? New car sales in the UK increased by 6% in August compared with the same month last year. The increase is the second consecutive monthly rise, after more than a year of decline in vehicle sales. Figures for July showed a gain of 2.4% over the same period in 2008. Industry figures revealed that 67,006 new cars were registered during August. The scrappage scheme is widely accepted to have prompted the boost in sales since its introduction in May. However, the scheme is expected to run out of cash by the end of the year. The Society of Motor Manufacturers and Traders' (SMMT) chief executive Paul Everitt said: 'The scrappage incentive scheme is having a positive impact, but with consumer and business confidence still fragile, there remain significant risks ahead. 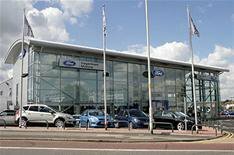 Figures revealed that the Ford Focus was the top-selling model during August followed by the Ford Fiesta. However, the figures from the SMMT also revealed that total sales for the year so far are still 21.5% lower than for the same period last year.